We're huge fans of magazines in our house and Bud's favourite pocket money treat is choosing one of his favourite character magazines to enjoy. They are generally packed with fun, educational activities, stories, stickers and puzzles so I know that he is learning as well as enjoying them. When Magazines.co.uk got in touch to tell me about their fab new Spin 2 Win competition I knew I had to have a go, and tell you all about it! Run through their Facebook page you will get five opportunities to win one of a great range of prizes. You simply spin to win. Prizes available include four Kindle Fires and money off vouchers ranging from £5 to £50 off magazine subscriptions. Magazine.co.uk have a really broad selection of subscriptions available and I have my eye on the DC Super Friends magazine which we reviewed the launch issue of last year. Bud really enjoyed it but we've struggled to find it in our local shops so a subscription would be the perfect answer to that. Their range included women's, men's, children's and a variety of specific interest magazines. 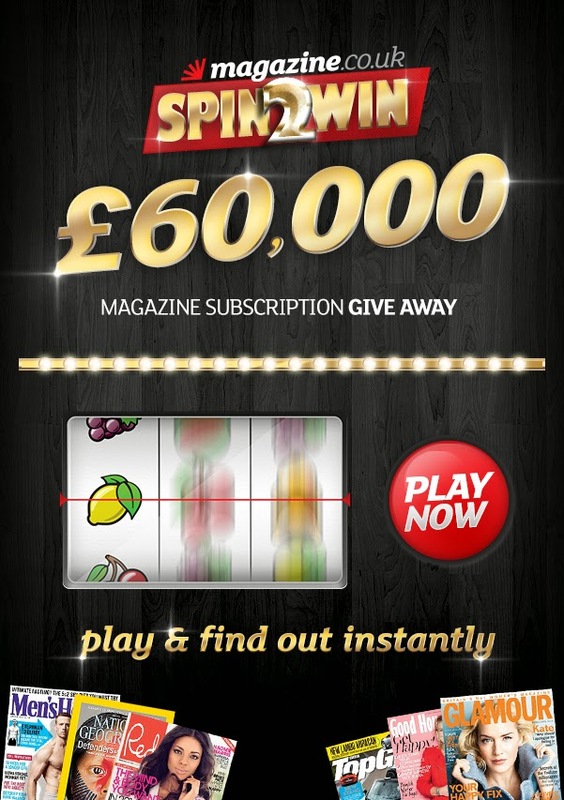 Why not take your opportunity to spin to win now on Facebook now? Disclaimer: I received a gift from Magazine.co.uk in exchange for sharing this promotion with you.